Man, I loved Connect Four. It was tic-tac-toe, only perfected. In later years, when I saw "Star Trek" (or was it on "Star Wars"?) where they played three-dimensional chess with pieces that hopped down levels and ate other pieces, I thought of Connect Four in some weird way. Here's a great video of Kanye West and Jonah Hill playing Connect Four. I won't spoil who wins, because ... well, you'll see ... but don't miss the part where Kanye gets up and puts on HIS OWN MUSIC to psyche himself up. Or something. Actually, they both seem pretty cool here. And anyone who's a friend of Connect Four is a friend of mine. 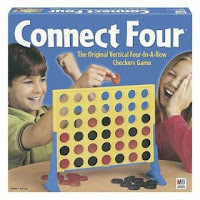 Did you have Connect Four as a kid? Share any memories in the comments. HERE, DIAGONALLY! Did have and STILL have. Connect 4 rocks! Gael, let the wookie win.